My vest buttons cover a number of commitments in the early nineteenth century, a booshway in the NEMM, AMM New England Brigade Booshway, and as a member of the Steering Committee of the Northeast Primitive Rendezvous Association, Inc. It is my goal to build bridges in our community. As a booshway of the NEMM, I believe that we, as an organization, should be inclusive rather than exclusive. It is not enough to sit idly by. We should actively reach out to others in our unique fraterinity with free and open communication to inform people of events that they may be interested in. Twice a year the North East Mountain Men hold a rendezvous. While not as big as some other "National" events, it is of high quality. Throughout the year we sponsor a number of "Gatherings" as well. They may take many forms. 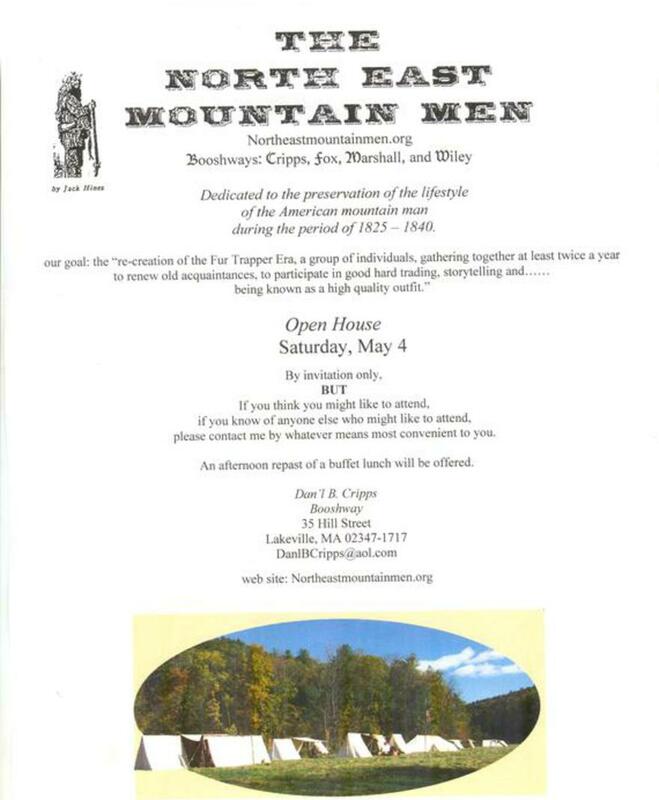 While these events are open to the NEMM members, as a general rule they are open to members of the American Mountain Men, the Women of the Morning Star, and invited, guests as well. There is quite an overlap between the NEMM and the AMM. Of our sixty plus active members, one third are also full members of the AMM with another ten Associate AMM members. Our membership includes the party booshways and clerks of the Westfield River Party and the White Mountain Party; all of the members of the Westfield River Party; most of the members of the White Mountain Party; and even a member of New York's Jed Smith Party. In 2014 we supported the Westfield River Party which hosted the AMM Eastern Territorial Rendezvous. It is our great pleasure to support other AMM events as well. We are proud to have a member of the Women of the Morning Star as one of our members. If you think you might be interested in any of our upcoming "Gatherings", I invite you to contact me by whatever means you may find most convenient to you or talk with one of our members. Support a local Club Shoot and our members who help run them.